Christmas is one of those moments where we can enjoy an elegant special dinner. 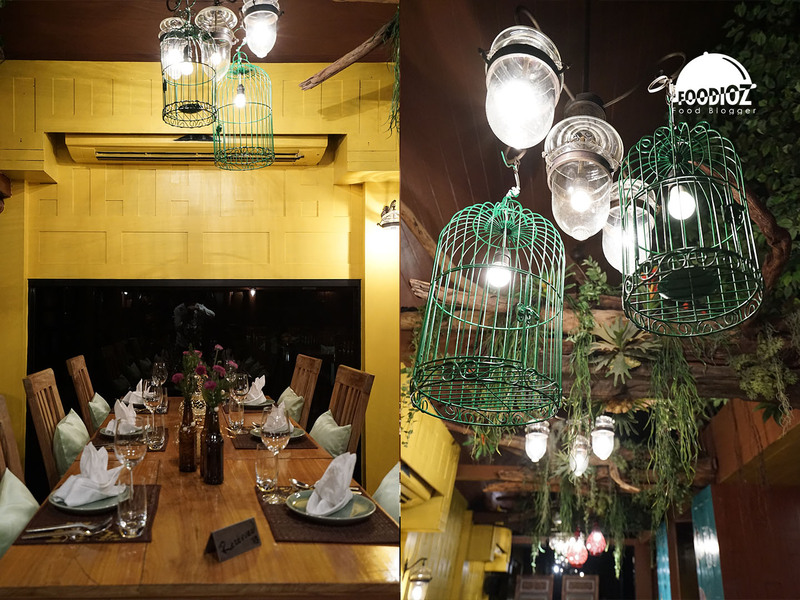 At Christmas 2017 last year, I had the opportunity to visit one Michelin restaurant in Bangkok, Thailand. 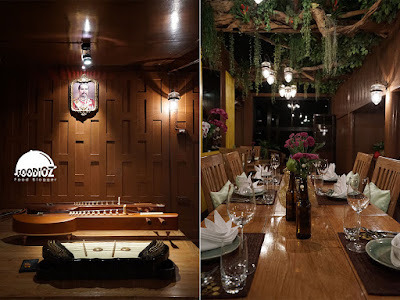 Chim by Siam Wisdom earns 1 Michelin star with an authentic Thai food concept. From the outside the restaurant looks like a house with dark brown wooden elements. Customer will be escorted to the second floor with ample dining area, dominant local feel, many Thai ornaments around the room. 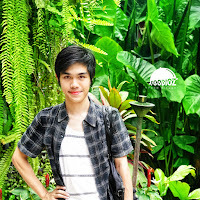 Here, i met Chef Noom who is the owner and manager of this restaurant. At a special Christmas event, they present a set of 6 menus ranging from amuse bouche to dessert. In accordance with the concept of fine dining, here is also offered a variety of wine options to accompany dinner. Once you see the menu listed, there are many names of foods that will be served with more than 10 types of names. It turns out each dish will be served with several types of menus with a one-bite portion of it. 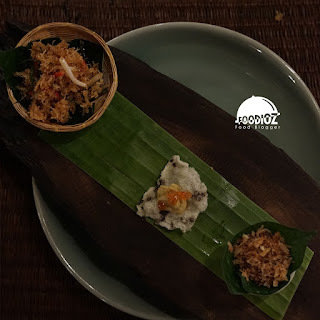 Starting from the amuse bouche, there is Smoke Eggplant, Mee Grob and Miang Kham. 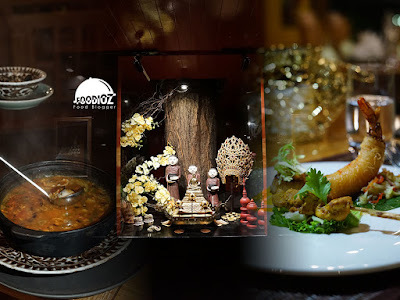 The three types of classic Thai food with creative modern presentation look very tempting. Smoke eggplant with crisp texture, as well as mee grob, crispy noodle dish with fragrant Thai citron and miang kham, an appetizer dish with varied elements in the leaf sheets that should be eaten together. After the amuse bouche, proceed with the starter. The presentation of beautiful and artistic food is always evident from every dish. 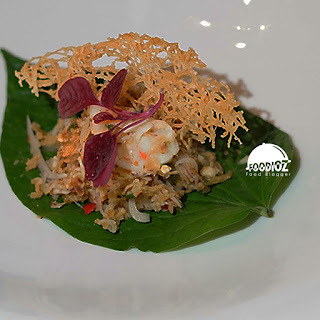 On this menu looks especially at the shrimp dish, Goong Sarong. 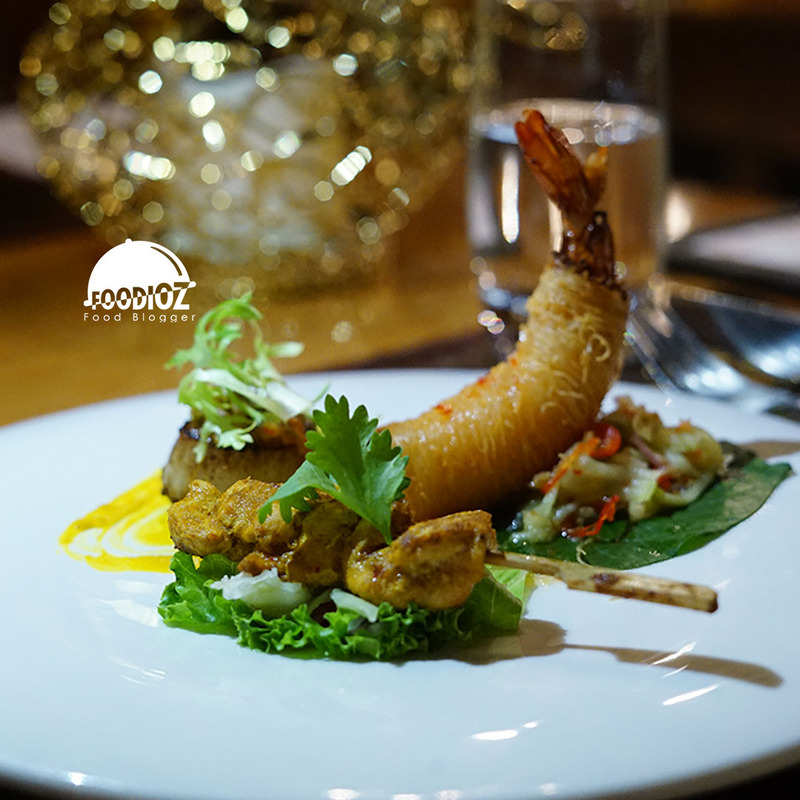 Prawns wrapped in vermicelli and fried, crisp and solid textures also tasty seasonings. Then, there is Gai Ko Rah, chicken satay with Indonesian-style satay inspired, served with spicy flavor. No less exciting, Hoy Shell, my favorite scallop with a soft and juicy texture. After that, i was served with a salad, Goong Sa Err. Thai specialties made from coconut shavings as the main ingredients, then Thai citron that gives the fragrant aroma and soft shrimp pieces. There's also a tom yum soup, but it's a little different from the ones we used to find around Thaialnd. 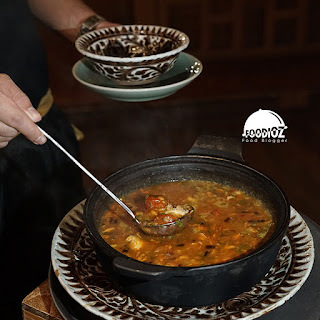 With the name Tom Yum Plachon Bo-Larn, a recipe from a ancient era with a serving of dark red soup, pieces of fish meat, sour and sweet combined into one and spicy that shake the tongue. After the soup, it's time for the main menu which consists of a very large serving. There is Rawang Nua Nong Lai, a yellow dairy curry dish, quality beef with a tender texture and flavor that seeps perfectly done. Other prawn dish is Chu Chee Goong Mae-Nahm, giant prawns with different curry sauce with dark orange color, both tasty but have different character. In addition to beef and shrimp, of course there are also vegetables that is Dok Khae. 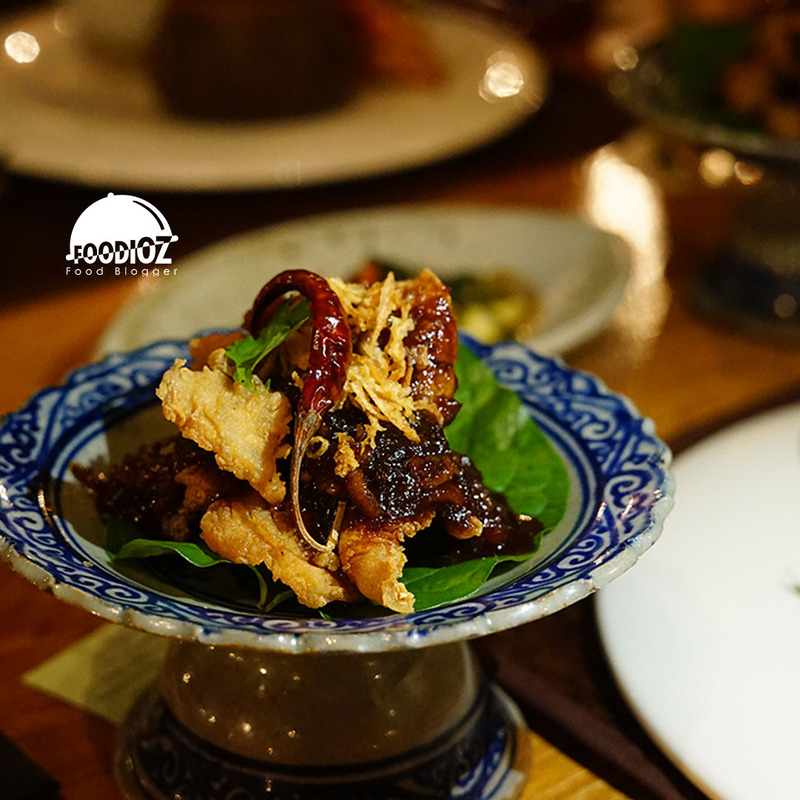 Sesban flower is fried crisp with shrimp paste that has a distinctive aroma. 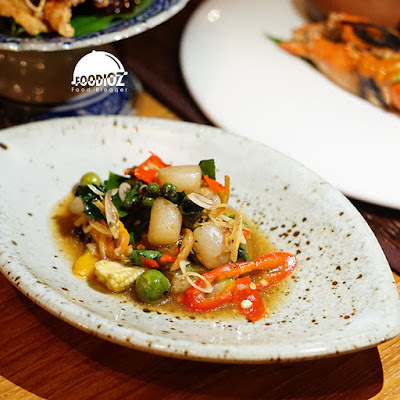 Do not miss the fish dishes Pla Jee Mun, white steamed fish with fresh tamarind sauce and Thai citron. The main course menu is complete with white rice that makes me very full at once. 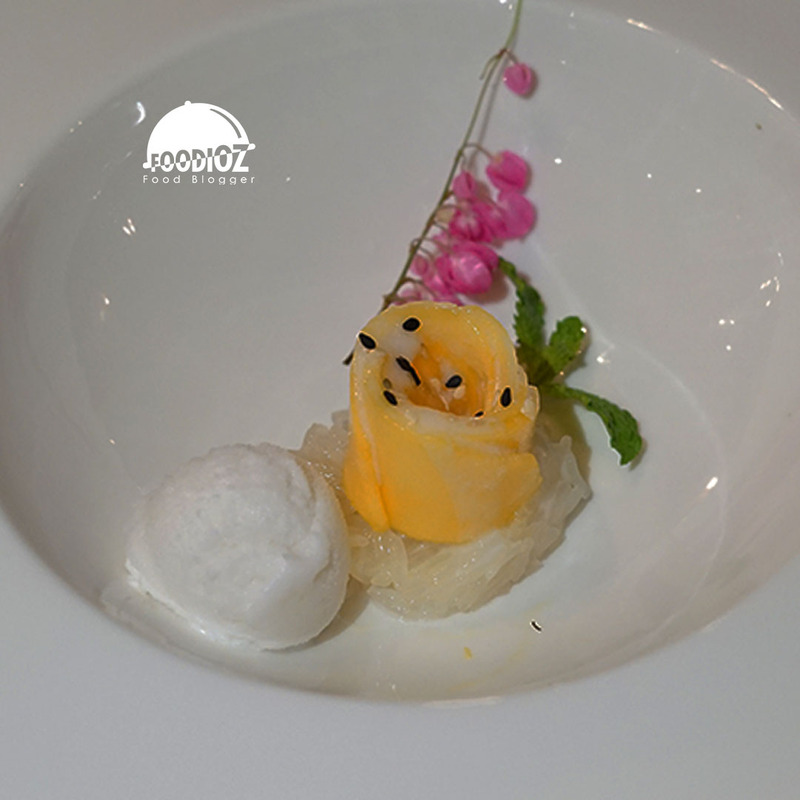 For dessert, the menu presented is none other than popular food in all corners of Thailand that is Mango Sticky Rice. But the appearance looks quite different in accordance with the concept of fine dining, artistic of a food becomes an important point. For the ingredients used, just like mango sticky rice in general is sticky rice and fresh mango pieces. 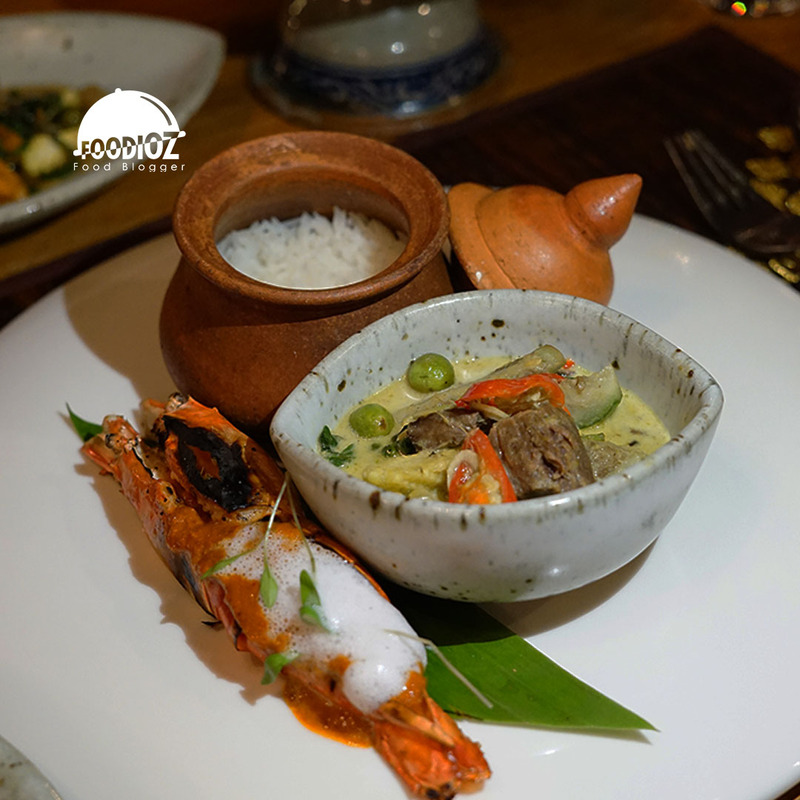 But here also served with cold coconut ice cream and provide different fresh flavors. The dinner experience was very satisfying. But in accordance with the quality of course there is a high price for the set menu. It is about THB 2,500 or Rp 1,000,000 ++, the concept of fine dining is classy with typical Thai classics and of course the quality of professional chef cooking taste.